The Crop Trust’s endowment fund secures funding for genebank operations forever. Genebank staff can get a bit defensive when their work is labelled as “routine.” Anybody dedicated to the care of living organisms knows that every day has its unusual moments. A day in the life of a genebank scientist may involve selecting and preparing large shipments of accessions to users in developing countries, including those recovering from war or natural disasters, or sending duplicates to the Svalbard Global Seed Vault in the Arctic or acquiring and testing new materials from partners that potentially contain highly desirable traits for crop improvement, managing field collections in the face of challenges presented by unusual weather, pests or large mammals. Days may involve all of the above, quite apart from the daily grind of making sure seeds in storage remain alive, tissue samples uncontaminated and data correct and up to date. Nevertheless, what sets apart the genebanks from the rest of the CGIAR’s portfolio of research4development programs and platforms, and has provided the rationale for precious ring-fenced funding, is the recognition that the core operations of the genebanks are essential and need to be carried out on a routine basis come what may. Otherwise, the living organisms in the genebanks’ care will not be living any more. Most of the funding going to the CGIAR genebanks is fixed and allocated on the basis of type of crop and collection size to support such routine operations. These funding allocations date back to a costing study that was carried out in 2009, but their historical roots date back to an even earlier study published in 2003, when economists first attempted to measure the basic costs of maintaining the different international crop collections. Their results supported the idea that costed routine genebank operations could be funded through the annual income from a well-managed endowment. It is no coincidence that the Global Crop Diversity Trust established the Crop Diversity Endowment Fund a year later in 2004 to provide sustainable, long-term financial support to the world’s most important crop genebanks. Although the principle was sound, those first costings were underestimated. If you examine the expenditure of a chronically underfunded outfit, you will undoubtedly come up with a figure that seriously underestimates what it really costs to run operations to acceptable standards. Assessing the current operating costs of a genebank that does not routinely test or multiply stored seed or distribute germplasm as much as it should gives a totally false impression of their real needs. But what exactly counts as routine when it comes to operating a genebank? How do you decide what activity takes precedence over another? Should a genebank manager prioritize collecting crop wild relatives at threat in the field or focus on the diversity already in the collection? Is it more important to introduce new efficiencies such as barcoding, or allocate precious funding to more staff to deal with health-testing? The answers to these questions were somewhat clarified by the establishment of agreed standards, by the FAO Commission, which dictate how ex situ crop germplasm in all forms should be managed. While these standards keep evolving over time, the international genebanks aim to comply with the highest standards since they have a legal obligation to the world to ensure crop genetic resources are conserved and made available for the long term. So we do know how a genebank should operate. One of the main issues that affect operations is that all genebanks have to deal with backlogs of seeds that require viability or health testing, regeneration, characterization or processing. Buried in genebanks there are often boxes of materials donated by breeders or other partners, which may be poorly documented and haven’t been tested. With their imperative to save and rescue, genebanks may make the first step of putting seed in the cold room but decide to deal with the processing and management later on, as the opportunity arises. While half of the collection may reach FAO standards, the rest might be temporarily “out of circulation” for such reasons. Given that germplasm demand, and thus distribution, is constantly on the rise but funding does not necessarily follow, genebanks rarely have the opportunity to do everything they want to do, when they would want to do it. This is where performance targets have made a real difference. A CGIAR-Crop Trust partnership to support a five-year program dedicated to genebanks, initiated in 2012, established a framework for upgrading genebanks and bringing them to a state of relatively routine operation. The follow-up program currently in full swing, called the Genebank Platform, continues the same approach. This involves setting performance targets that ensure a genebank is functioning without significant backlogs (for example, 90% of accessions are immediately available, safety duplicated and documented). The framework also incorporates a system of technical review and funded action plans to bring the genebanks up to this high standard. Performance targets and workplans are implemented within an evidence-based system of quality management, which requires every genebank to document its policies and processes in so-called “standard operating procedures,” which are audited and externally validated. With a sharp eye on costs and financial management, as well as technical standards, the Genebank Platform has made steady and tangible progress. The IRRI genebank has reached and sustained performance targets and as of 1 January 2019 can rely on funding from the Crop Trust endowment fund. Photo: Isagani Serrano/IRRI. How do we know? Because in 2018, the Crop Trust entered into a long-term partnership agreement (LPA) with the International Rice Research Institute (IRRI) based on a comprehensive genebank business plan, the first of its kind. The IRRI genebank has reached and sustained the agreed performance targets, functioning on a fixed budget, for several years now. Even better, the routine operations of the genebank are now embedded in an institutional program, Harnessing genetic diversity to accelerate impact. 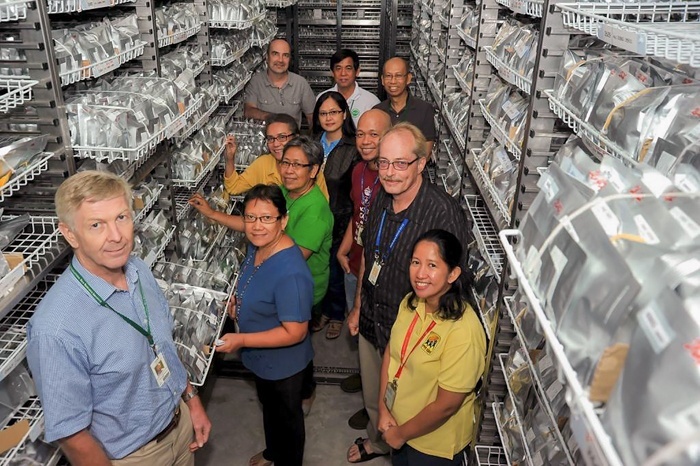 This means that its new business plan doesn’t just guarantee that IRRI’s genebank can rely on funding from the Crop Trust endowment for routine operations: it is also supported by matching funding from IRRI to promote the use of the collection. As part of the LPA, IRRI will also provide backstopping to five national genebanks to help their crop diversity conservation efforts. Routine or not-so-routine, the LPA now covers it all and in reaching such an impressive standard of operation the IRRI genebank can be said to have its rice cake and eat it too! Congratulations to them. Who will be next?